Cobaya underground and experimental dinner #71 went down on December 18th, 2017 at Ariete in Coconut Grove. Chef Michael Beltran treated the guinea pigs to a classically inspired delicious meal from start to finish. His flavors were great and execution was solid. Chef Beltran is a young rising star chef who has worked for some of Miami's best chefs including Norman Van Aken and Michael Schwartz. 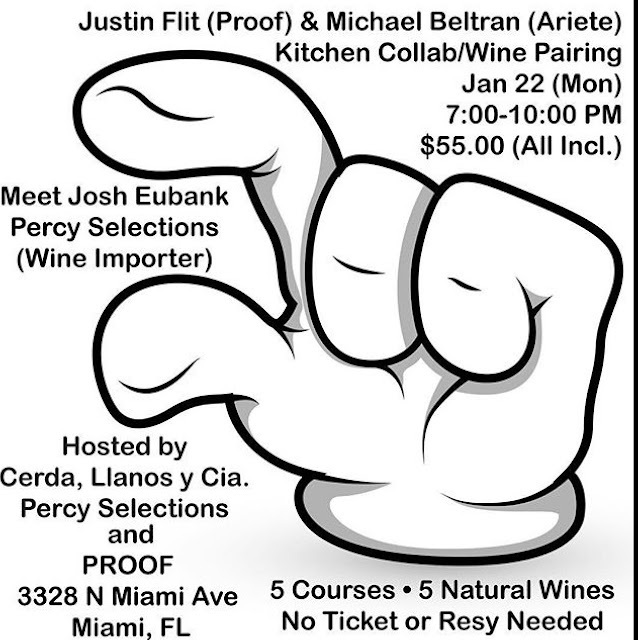 Miami needs more home grown talented chefs like Michael so head to the Grove and support a local chef and restaurant doing things the right way. Chef Patel hard at work. Cobaya experiment #69 took the guinea pigs on a trek down to Homestead on a beautiful Saturday night. The dinner was located at Chef Niven Patel's backyard farm where he prepared several courses of farm-to-table Indian cuisine. It should be noted that he had serious help in the kitchen from his mother and mother-in-law. This was a great meal and a very fun night. Niven opened his first restaurant this year, Ghee in Downtown Dadeland which specializes in flavorful Indian fare. He recently opened a second location in the Design District. I highly recommend paying him a visit. Welcome Cocktail courtesy of the now open Edukos. 80 die hard Guinea Pigs made the drive down to Homestead and enjoyed a fantastic meal. Niven and family with his Ghee team. Experiment #68 took place on January 12, 2017 at Pietro Morreli's fantastic loft space overlooking Biscayne Boulevard in the MiMi District. Big thanks to Pietro for his generosity and hospitality. And for connecting us with Paolo Dal Gallo of Zonin Wines for pouring some excellent pairings throughout the night. This was a fun night in a great venue with a good group and wonderful host. oh and the food was good too. Thanks to the guinea pigs whose interest and support makes these events possible.